Shares of United Technologies are trading at three month highs today. The stock is up just over 1.5% after taking out both the May and June highs. Following an impressive rebound off the early May lows UTX has been trading in a very narrow range while a scooping 200 day moving average provided solid support. This healthy action has set the stage for a second rally leg. This morning’s breakout type move could provide the spark needed. 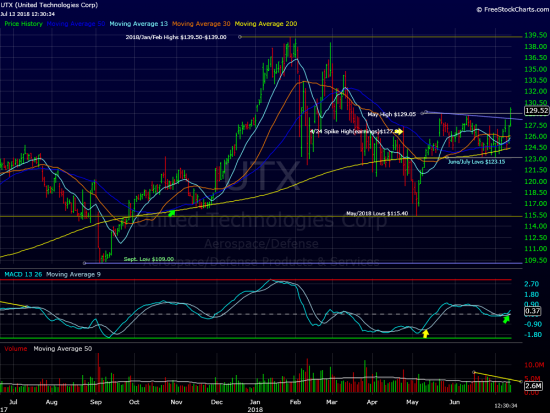 Trading notes: UTX is in the process of leaving behind a major support zone between $129.00 and $127.00. This area includes the May and June highs near the upper band as well as the initial July peak. UTX has a solid base underneath. Multi week June and July lows held the 200 day moving average. Back in January, after a 27% surge off the September lows, UTX entered extremely overbought territory. The stock has remained well below since and as the week comes to an end the daily MACD indicator is neutral. By this measure UTX has plenty of room to run. On the downside a close back below $124.00 would violate this week’s low indicating more basing will be needed before UTX can resume the rally off the May lows. 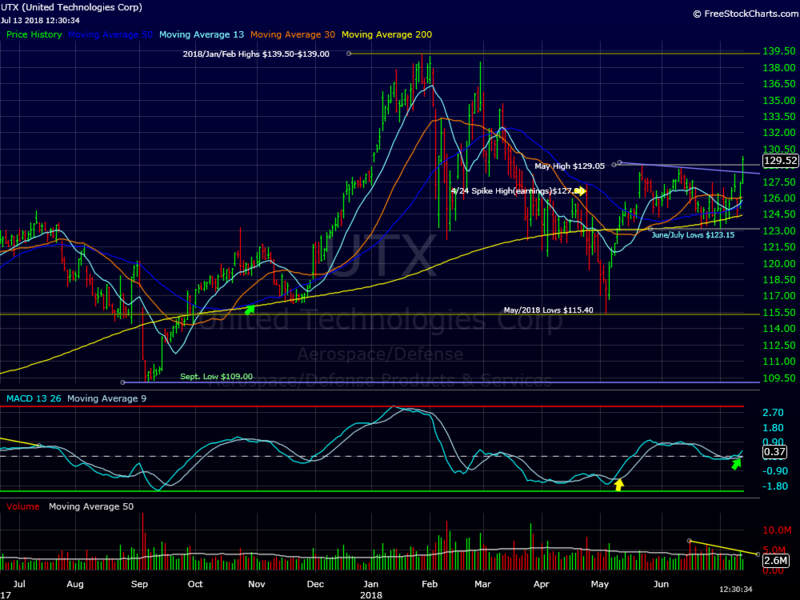 We consider UTX a fairly low risk buy near current levels. We are long the stock in some managed accounts. Earnings are due August 27.